Much like mechanical drives and solid state drives regular CPU air coolers are nowhere near to be replaced by the rather new in comparison AIO (all in one) liquid CPU coolers. When the first "serious" AIO models made their appearance just over a year ago some of us did think that it wouldn't take long for that to happen but since to date AIO models haven't really achieved much higher cooling performance compared to high-end CPU air coolers it will obviously take longer for that to happen (if of course something new and better comes along until then). Because of that it doesn't really come as a surprise that there are many manufacturers out there that still focus in the design and manufacture of CPU air coolers one of which is Scythe and today with us we have their latest Ninja 4 model. "Tools, I love getting tools for review and not just power tools and such but electronic tools like IR thermometers. Infrared thermometers can be very handy for computer work and for just around the house in general. Today for review I’ve got the Nubee NUB8500H Temperature Gun Non-contact Infrared Thermometer and it seems accurate and it’s well made. The thermometer has several options on it and nice large and easy to read display and even a red dot laser so you can visually see what you’re measuring. Read on to learn more… "
Meanwhile EK Water Blocks also has a full-cover watercooler for MSI's latest and greatest GeForce GTX 980 Gaming 4G graphics card in its portfolio. For us this is reason enough to have a close look at the cooler itself. Apart from that we want to know if there is any performance when aircooling or watercooling the card. The XFX R9 380 4GB arrived at the lab in a plain, for once, undamaged cardboard box with the part description on the side on a large piece of white paper. Happy dances ensued for about 2 minutes then in a flurry of ripping and tearing befitting a Great White Shark we opened the box. The bountiful box contained an XFX R9 380 4GB sporting a core clock of 990 with 4GB of GDDR5 running at 1425 MHz and effective clock on that is 5700 MHz. Boasting 1792 Stream processors channeling data to the GDDR5 across a 256-Bit Bus. It’s still based on the Tonga Pro core but the technology around it has had time to mature and AMD and their vendor partners have put that time to good use developing better technologies to surround that core with. As long as the GPU competes with other GPU’s at its price point we don’t care if it’s dressed in a grass skirt and serving drinks on a plane. UK etailer Overclockers UK have been selling components for a long time, but they also create a wealth of systems … to suit every bank balance. Today we are taking a look at one of their more expensive systems – the overclocked, watercooled extreme gaming PC called the ‘Infin8 Nebula’. This is based around the 4790k, overclocked to 4.6ghz, alongside not one, but two GTX980’s in SLI which are also watercooled. "On the test bench today we have BeQuiet's Dark Rock TF heatsink - a top-down dual tower heatsink which features a pair of BeQuiet SilentWings fans and stands 130mm tall. The Dark Rock TF heatsink is built around six 6mm diameter heatpipes which link a large primary aluminum fin stack and smaller secondary set of aluminum cooling fins to a chunky copper heatspreader below. The 135mm PWM fans are arranged in a push-pull configuration, exhausting downwards so related motherboard CPU VRM components benefit from the cooling air flow. " Should you be a fan of these fans? We gave the BitFenix Spectre Pro LED the good ol' TP test. "The Silverstone FQ and FW Fans arrived Technic3D. The Fans at least 20,7 dB(A) and up to 2.000 U/min for your Case or CPU-Cooling can you see in the following Review on Technic3D." The Scythe Mugen Max heatsink weighs 870 grams and stands 166mm tall, it has a footprint of 146x110mm. The heatsink is constructed around six 6mm diameter copper heatpipes which are soldered to a 2mm thick nickel plated copper base plate, rather than being left exposed as with 'heatpipe direct touch' coolers. The heatpipes are swaged into a 113x145x84mm aluminum fin stack which is broken up into four nearly separate cooling towers. For those with case windows, the Scythe Mugen Max is capped by a polished aluminum fan shroud that obscures the heatpipes for a neat, finished appearance. Frostytech is testing the Phanteks PH-TC12LS heatsink, a top-down low profile heatsink that stands 74mm tall and weighs in at 500grams. The PH-TC12LS has a footprint about the size of the 120mm PWM fan that rests atop its black-painted aluminum fins. The cooler itself is built around six 6mm diameter nickel plated copper heatpipes which run the length of the fin stack, take a 180 degree turn and terminate in a thick copper heatspreader at the base - no exposed heatpipes here. The fan is mounted on little rubber pads to cut down on errant vibrational noises and it spins at 1800-500RPM, moving 53CFM at 1.72mmH2O according to manufacturer specs. Phanteks' PH-TC12LS heatsink installs onto AMD socket AM2/AM3/FM1/FM2 and Intel LGA2011/1366/115x/775 processors. Retail price is estimated at $49USD/CDN through the usual computer stores. "The whole premise behind the slim-tower Phanteks PH-TC14S heatsink is not overhanging memory slots - if you've built an Intel X99 based computer recently, you're undoubtedly aware that the memory slots straddle either side of the LGA2011-3 CPU socket with a little less than 20mm to spare." The Phanteks PH-TC14S heatsink stands 161mm tall and weighs 740grams. It's built around six 6mm diameter heatpipes, a chunky nickel plated copper heatspreader and two black painted aluminum cooling fin towers, each 19mm wide. At the center of the heatsink is a 140mm PWM fan that operates at 1600-500RPM, producing upwards of 47dBA according to our real world noise measurements. The fan itself moves 68CFM at 1.62mmH2O, according to manufacturer specs. he aluminum fins of the Phanteks PH-TC14S heatsink have been painted black for aesthetic reasons, not anodized as several novice reviews have mistakenly reported. A coating of paint on a heat transfer surface is not ideal as it insulates the aluminum fins from the surrounding air mass to some degree. "The Noctua NH-U9S heatsink stands 125mm tall and has a square footprint of 95x95mm. Weighing 618grams, the heatsink is built around five 6mm diameter heatpipes which are soldered to the aluminum cooling fins and copper base plate in typical Noctua fashion. " 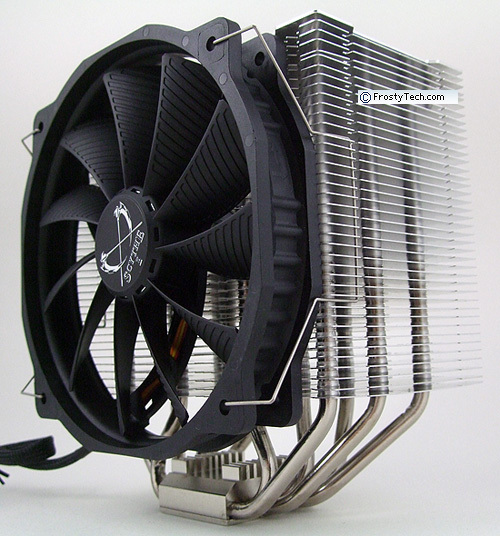 "On Frostytech.com's review bench today we find the Scythe's Ashura heatsink; this is a fairly standard tower cooler equipped with a 140mm fan. The Ashura cooler stands 162mm tall, making it suitable for full tower cases where AIO liquid coolers are often too bulky." "Noctua has responded to the siren call for a more compact CPU cooler with its NH-U9S heatsink. It claims this mid-size cooler has "100% RAM compatibility" and "100% compatibility with PCIe cards on miniITX" motherboards. That's relatively easy to accomplish by sticking to the Intel/AMD thermal design guidelines, but how much thermal performance is sacrificed? Noctua's NH-U9S heatsink is an upgraded version of the NH-U9B, incorporating more heatpipes, a completely revamped fin geometry and a higher airflow Noctua NF-A9 fan. Noctua's NH-U9S mid-size heatsink is rated to heat loads of 140W TDP and installs onto AMD socket AM2/AM3/FM1/FM2 and Intel LGA2011-0/LGA2011-3/115x processors. "